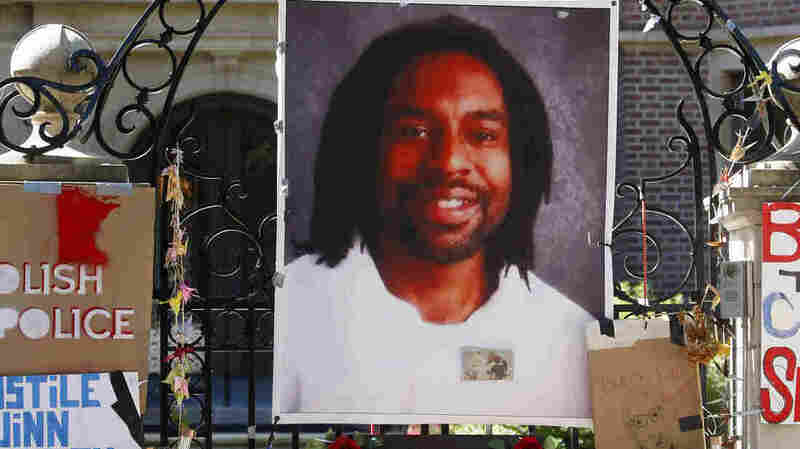 Charity Honoring Philando Castile Pays All Lunch Debts In St. Paul School System : The Two-Way Castile, who was shot and killed by a police officer in 2016, worked in public school nutrition. A fund in his honor pays for the lunches of kids with outstanding cafeteria debts. A memorial with a photo of Philando Castile adorns the gate to the governor's residence in St. Paul, Minn., in 2016. "Philando Feeds the Children," a fundraiser in memory of school cafeteria supervisor Philando Castile, who was shot and killed by a police officer in 2016, has paid all outstanding student lunch debt at all 56 schools in the St. Paul, Minn., Public School system. "Philando is STILL reaching into his pocket, and helping a kid out," the charity wrote in an update posted last week. "One by one. With your help." The school district confirms that Pamela Fergus, who runs the fundraiser, has dropped off a $35,000 check at the school district, "enough to clear the debt of nearly 1,800 students," the Minnesota Star Tribune reports. More donations are expected, the paper says. Castile, who was a school nutrition supervisor at a St. Paul public school, was beloved by the students at his school. He didn't just work in the cafeteria; he tutored and mentored students as well, as Minnesota Public Radio reported. He knew every student's name. Castile was shot and killed during a traffic stop in a St. Paul suburb in July 2016, as he reached for his wallet. He had informed the officer he had a firearm, and that he was not reaching for it. His girlfriend Diamond Reynolds live-streamed the immediate aftermath of the shooting, which showed Castile shot in the car as police did not initiate first aid. Reynolds' 4-year-old daughter was in the back seat for the entire ordeal. As NPR has reported, Castile, who was black, was stopped by police 46 times over his driving career. Only six of those stops were for "things a police officer would notice from outside a car — things like speeding or having a broken muffler." In the suburbs around the Twin Cities, African-Americans and Latinos are up to seven times more likely to be stopped by police than white drivers are. Police officer Jeronimo Yanez, who shot Castile seven times, claimed he feared for his life as Castile reached for his wallet. He was found not guilty of manslaughter, a decision that led to renewed protests. "Philando Feeds the Children" was set up as a college project after Castile's death, the Tribune says — students in Fergus' diversity and ethics class kicked it off. On the fundraiser's website, Fergus notes that the project began with the "approval and blessing" of Castile's mother, Valerie Castile. The initial goal was to pay off lunch debt at the J.J. Hill Montessori elementary school, where Castile worked. Castile used to pay out of his own pocket to cover lunch for students who couldn't pay, Fergus has said. "Philando was "Mr. Phil" to the students at J.J. Hill. He supervised their food program and interacted with the kids every day. He knew their names and their diets. He LOVED his job!" the fundraiser's initial posting read. "Philando's death affected every one of those kids. This fund hopes to provide the kids with a lasting connection to Mr. Phil. Please help Philando continue to feed his kids." But as time went on, the funds kept coming, and the project expanded outside of a single school. "The St. Paul school district said it typically builds up about $60,000 in lunch debt each year. "The debt accumulates when students can't pay for their meals. A federal program offers free and reduced-price meals to families who qualify, but some families who earn a little bit too much still can't afford lunch. Other families who do qualify may not sign up. They may be unaware or unwilling to share personal information. "Fergus said she'd like to raise enough to extend the donations outside St. Paul. 'The end game is that this keeps going until people don't even remember who Philando Castile is or until I'm dead and gone, whichever comes first,' she said." At the time, Fergus' fundraiser had collected more than $80,000. Now the total is more than $150,000. "We continue to challenge ourselves and the greater community to make this fund permanent," Fergus wrote in a recent update. "Mr. Phil will feed his kids for as long as we can raise the money."